I’ve enjoyed going to Disney theme parks a few times in my life (most recently, my son and I went to Tokyo Disneyland when they revamped their Star Tours attraction), but I wouldn’t say I’m a huge Disney fan. A lot of that is just because I live so far away from any of the parks, but I also don’t love standing in line for hours (or paying extra for the privilege of standing in a shorter line). That said, I do feel like I will have to try and make it to the new Star Wars: Galaxy’s Edge section of Disney World/Disneyland at some point. The attractions look pretty amazing, but as a collector the merchandise was what really caught my eye. Take a look at the video below from The Laughing Place, which introduces all of the merchandise that was shown at Star Wars Celebration Chicago. This stuff looks absolutely incredible, and is totally different from what I saw at Tokyo Disneyland. Most of that was typical souvenirs with Star Wars characters on them (and even then it was almost entirely the most popular ones, like Vader, Yoda, Stormtroopers and the droids). Good luck finding something with Jabba on it! But this Galaxy’s Edge stuff is incredible. There’s a huge amount of it, and it seems to show a real understanding of Star Wars and the kinds of things Star Wars fans might want. The image directly above and the one at the top of this post (again, from The Laughing Place) shows a bunch of toys from the “Toydarian Toymaker” that are done in a simple handmade style and could almost pass as “in-universe” toys, if it weren’t for the ones of specific people like Rey and Finn. And how cute is that stuffed Hutt in the first photo? And these Kowakian Monkey-Lizard toys will apparently sit on your shoulder and can be operated like puppets. Love it! 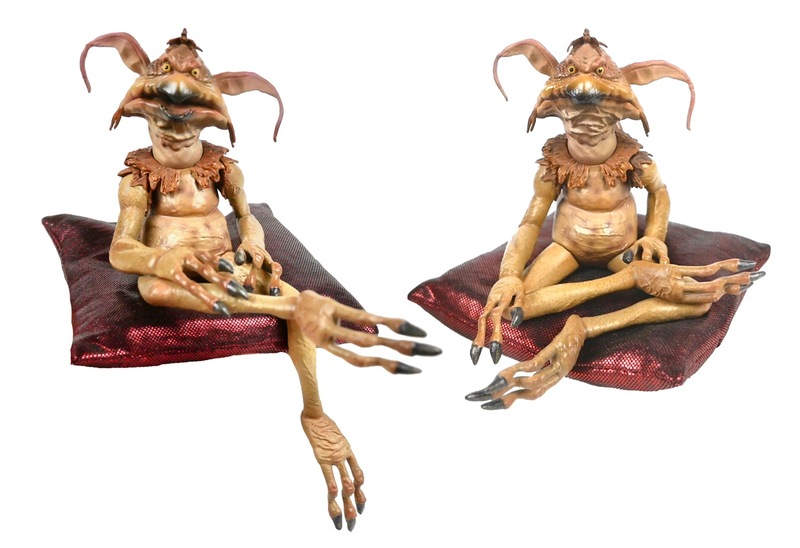 Back in 2013, Disney had a stuffed latex Salacious Crumb figure that seemed pretty nice at the time, but this is next-level stuff. My only concern is the price. The other Jabba’s Palace character that stood out to me was the worrt you can see in the bottom left above, but I’m sure there will be more. Of course if I really did visit the park, I doubt I would be able to limit myself to just Jabba-related things. I’m going to have to bring a wheel barrow just to carry everything I want! Hmm… Maybe I should stick to just buying a few things on eBay. Anyway, I think Disney is on the right track with this approach and look forward to seeing how things develop. More Star Wars Geeki Tikis Incoming! Geeki Tikis is a line of ceramic mugs that combine pop culture characters with a tiki esthetic. 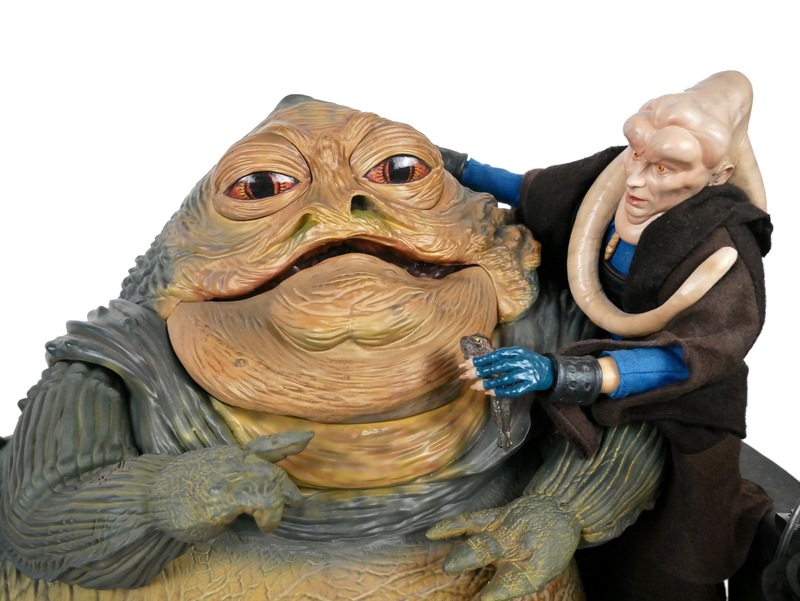 I posted both written and video reviews of the Jabba & Salacious Crumb set that was a Celebration 2017 exclusive shared with Think Geek, and also made a video review of Series 2 of their Star Wars line last year. In a nutshell, I really like these even though I wouldn’t really consider myself a big fan of the tiki look. I think they are very well executed and look great on a shelf. The good people in charge of this product line at Beeline Creative got in touch with me to let me know about some of their upcoming Star Wars products — and there are quite a number of them! I’ll start with the Jabba-related ones, but I’d also like to touch on the general Star Wars line as well. 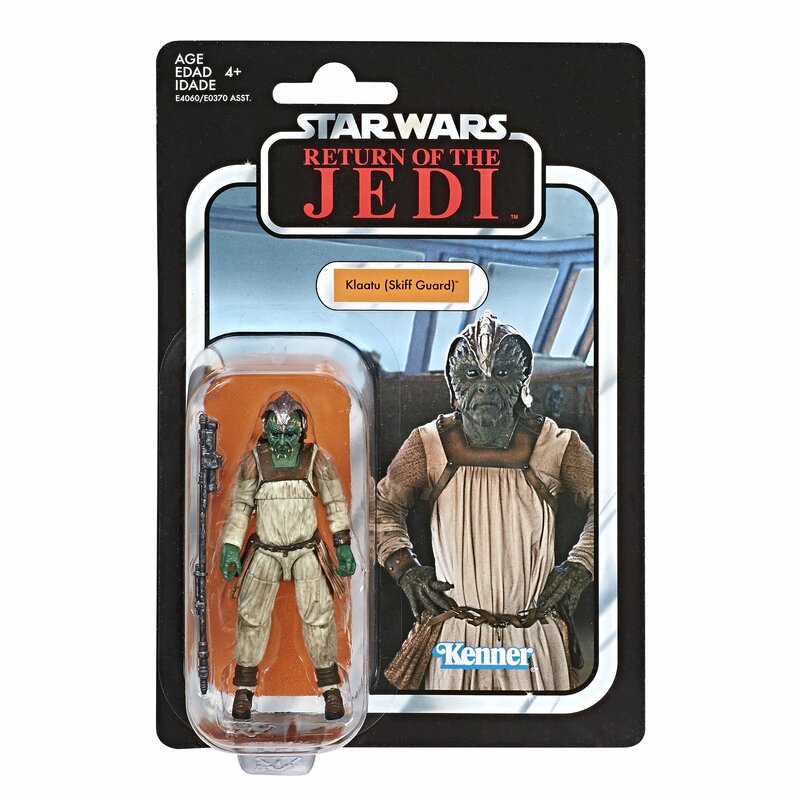 I’ve already posted about the Rancor/Jedi Luke set above in my rundown of Celebration 2019 exclusives, although I’ve learned a bit more about it since then. The price is going to be $60 and it will apparently not be available anywhere else but the show (although it might still make an appearance at the Reed Pop website). At least as exciting as the Rancor set are four characters in Series 3 of the Star Wars line, which are going to be available first at FYE. These include a Gamorrean Guard, Han in Carbonite, Leia as Boushh and Jedi Luke. I heard about the Han in Carbonite before seeing the photo, and had some trouble imagining how they would pull it off in the tiki style, but I think it looks great. I would love to have Jabba’s Palace display that includes all of these. Boushh has been given the ability to hold a skewer in lieu of her staff, which is a clever touch. They aren’t up on the website as of this writing, but they will be $19.99 apiece for everything but Han in Carbonite, which will be $29.99. There are also a couple of others that will be first available at Toynk and are tangentially related to Jabba: Han Solo and Greedo. This will apparently be a set that will retail for $50. A little expensive, this one! They will also have a Death Star for $40. Going along with this is a Millennium Falcon “Mega Mug” that includes Chewbacca and Han Solo muglets. I think this looks great, but it costs a hefty $100. They are also branching away from the ceramic mugs that make up the rest of the line to add some plastic cups in the same tiki style. These will apparently go for $12.99, which may or may not be expensive depending on how nice the plastic is. They look good in the photo below, and I think it would be nice to have non-breakable versions of these cups. Finally, they are going to be releasing a set of 18 mini muglets for $180, and if you preorder at Celebration for September delivery you can get an exclusive golden C-3PO. Some of these are characters that have already been done in full-sized versions and some are new characters like Nien Numb, but I think they are all newly designed for this size. Whew! I didn’t even get a chance to cover the swizzle sticks or coasters that are apparently also on the way. This line must be quite popular for them to be releasing so much product — especially when you consider that Star Wars is only a portion of what is available for the entire Geeki Tikis line. Do you have any of these? Let me let you in on a little secret. I’ve never been to a Star Wars Celebration. The main problem is that as a self-employed person I get no vacation time, so taking time off to go to an event like this not only involves the costs of admission, transportation, lodging, and so forth, but also requires me to skip client work that I would otherwise be doing during that time (and yes, I work most weekends at least in some capacity). It would be hugely expensive for me and I’ve just never been able to do it. This is particularly painful this year since I don’t live that far away from Chicago and I had really hoped to make it work this time. But alas, no. That’s why it was so nice to get this in the mail recently from Regal Robot. They are going to be selling these Jabba’s dais gargoyle magnets exclusively at Celebration (at Booth #3419), but were kind enough to send a sample to me to review. From what I understand, they will be selling for $20 and there will be roughly 300 of them available, but they will be split up over the four days of the show to give as many people as possible the chance to get one. So if they sell out one day, try to get to the booth early the next day and there should be more. They appear to be made of resin (with a metal ring in the mouth), and I have been told that they are all hand-cast right in Regal Robot’s New York shop. The magnet in the back is impressively strong, so I don’t think you need to worry about this guy falling off. I think they’ve done a great job of making it look like metal, complete with the bluish green patina that you would expect. Above, you can see it next to the gargoyle from the recent Sideshow Jabba’s throne, showing that it’s actually pretty large, all things considered. 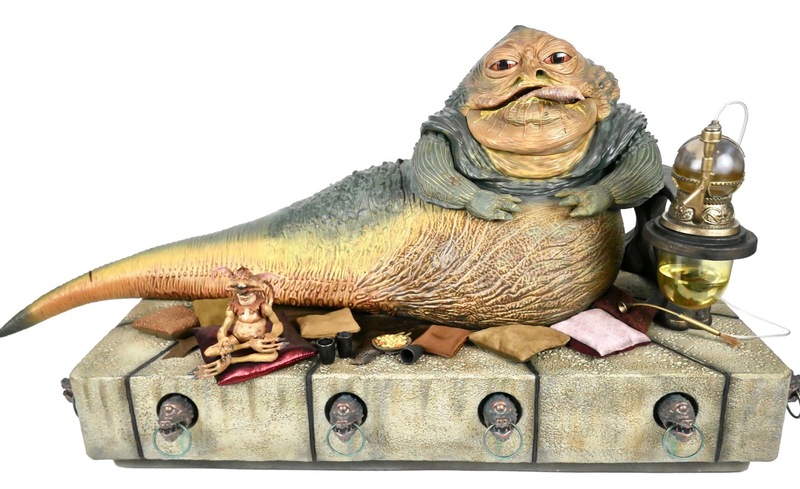 In fact, I believe it is the largest version of a Jabba throne gargoyle that has ever been commercially released. That said, it’s still a very manageable size, which is definitely a plus for something you’re buying at a convention. $20 for an item like this that is being produced in such small quantities should be a no-brainer for Jabba fans attending the show. I’m not really very in tune to the 3 3/4″ collecting world, but these certainly grabbed my attention when I heard about them. First of all, Hasbro is releasing a new version of the skiff, which seems like a no-brainer given that Hasbro’s new sail barge should be coming out pretty soon. I’m not entirely sure of all the ways that it differs from the previous releases, but it looks like it should have a better paint job and a cool floating base. To go along with the skiff, they are also releasing three skiff guard figures in a set: Vizam, Vedain, and Brock Starsher. I believe modern figures of all of these characters have been released individually in the past, and in fact I think I own them all, although I have apparently neglected to post about them here. I’m not sure if these are straight-up repacks of those figures, but they seem to be — maybe with a slightly upgraded paint job. A bit more exciting are the releases of carded Klaatu, Yak Face and Boushh figures. 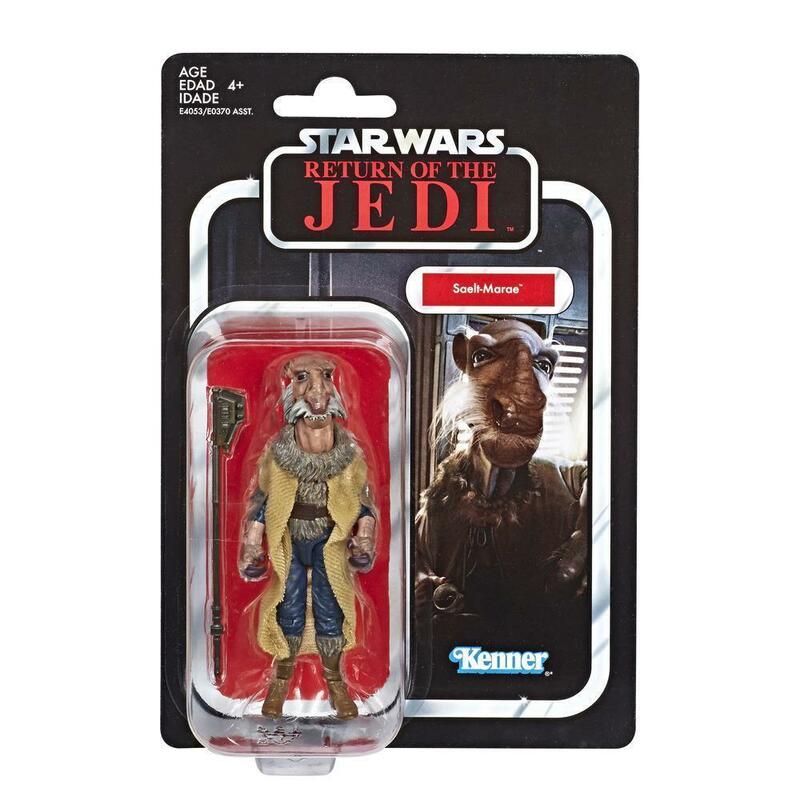 Fans have wanted a new Yak Face for years, so that’s exciting, although they are also including him with the new sail barge as well. And I think this particular outfit for Klaatu is new in a modern figure. Boushh seems like she might be a repack, but let me know if I’m wrong about that. But by far the most exciting news was that there is going to be a Walmart-exclusive Jabba’s Palace Adventure Set, which is a sort of environment that includes some things we’ve never had in a toy, as far as I know. 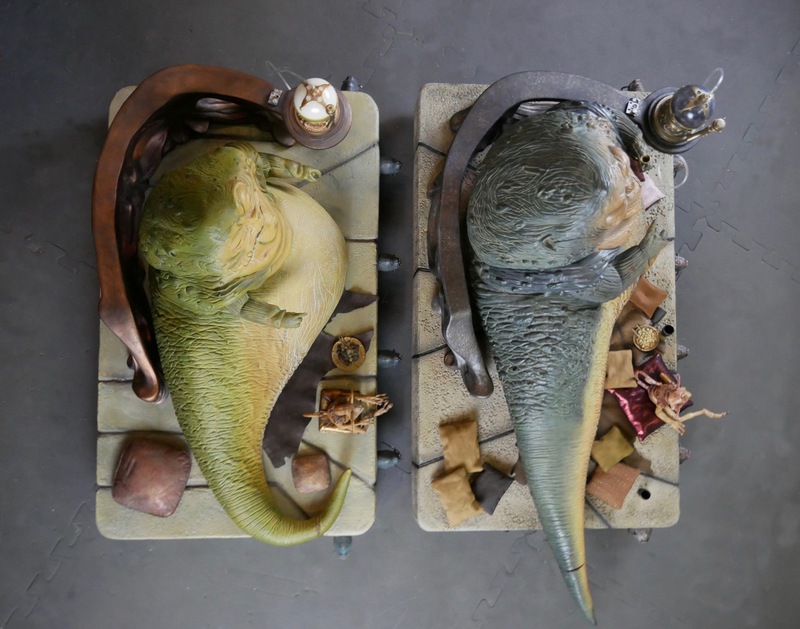 It not only has some cool archway pieces that would look nice in the background of any Jabba’s palace display, we even get the tauntaun and jerba head trophies hanging on the wall! In addition to the environment itself, you also get Ree-Yees and Han Solo with Carbonite Block figures, apparently on Vintage Collection cards. 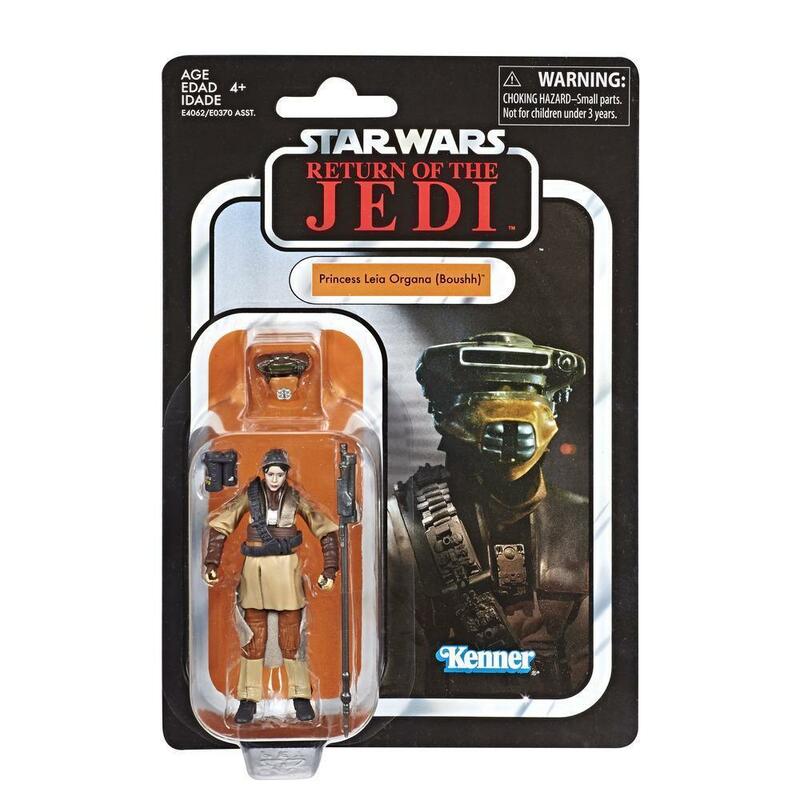 Plus, Walmart is also releasing the exclusive Skiff Guard Lando figure shown above. Say what you want about Walmart, but they have had a lot of great Jabba-related exclusives over the years. The 3 3/4″ Vintage Collection Jabba originally came with the Toys R Us-exclusive Rancor Pit playset back in 2015, and will also be included in the Sail Barge set. 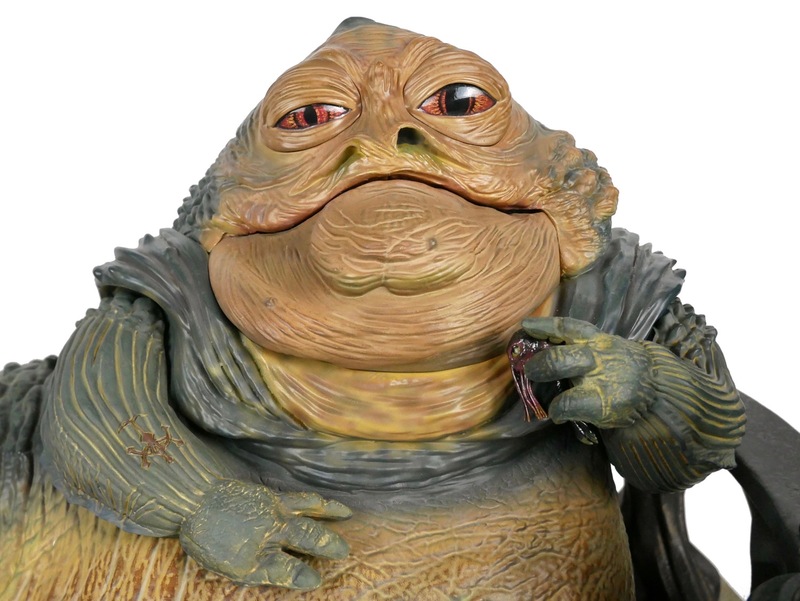 But it seems unlikely that Hasbro would be releasing all of these new things without also releasing Jabba on his own somehow. I’m not up to date on all of the rumors, etc., but the fact that they display figures like Jabba, Bib Fortuna, and even Ephant Mon on the box artwork strongly implies to me that these figures will also be on the way sooner or later. This is all very exciting for a Jabba collector like myself, even if the majority of the releases do seem to be repacks of existing figures. 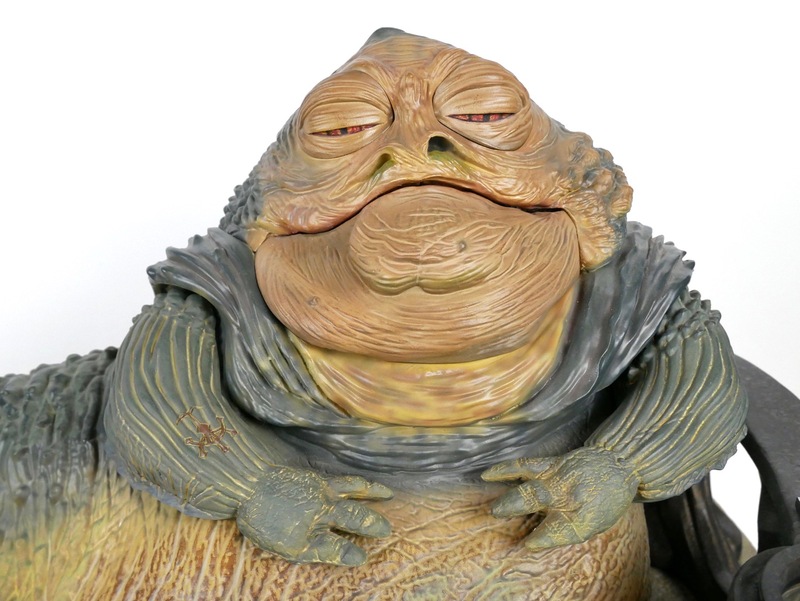 I still remember the day that I opened up the original Sideshow Jabba figure 11 or 12 years ago. It was one of the first “high end” collectibles that I had bought, and at the time I wasn’t even really specializing in Jabba the Hutt — although I was of course a fan of the character. I was really blown away by the size and detail of the whole setup, and while the paint wasn’t perfect I was just impressed that something like it existed. It didn’t seem very likely that anything would come along to top it. 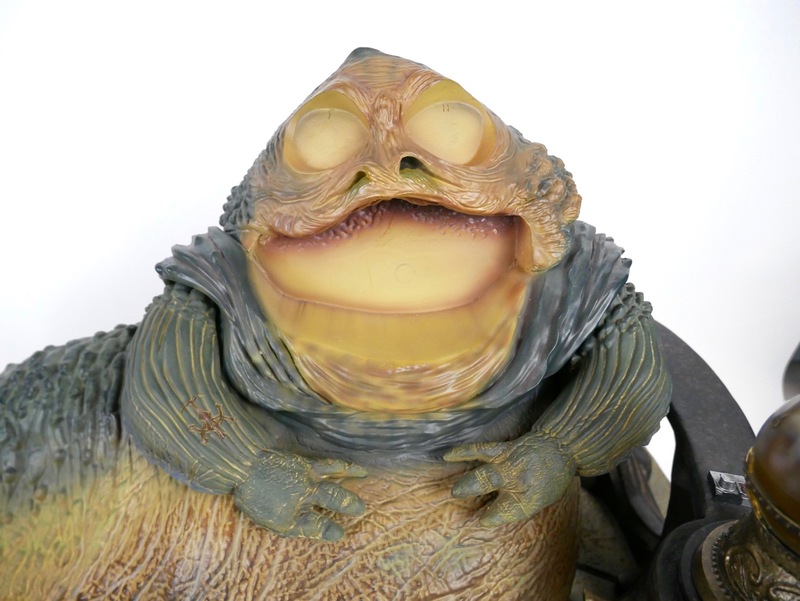 But then a few months ago Sideshow announced that they would be making a completely new 1/6 scale Jabba. To say I was intrigued would be an understatement! I received mine a couple of weeks ago and made a video review of it right away, but I thought it would be worth tackling the figure in writing and photos as well. 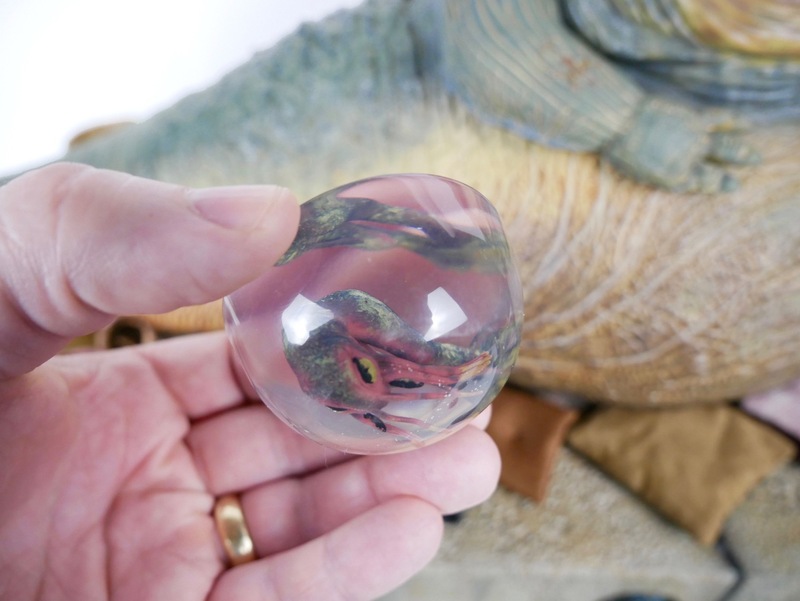 How does it measure up to the original Jabba, and is it worth the hefty $799 price tag? Let’s see! 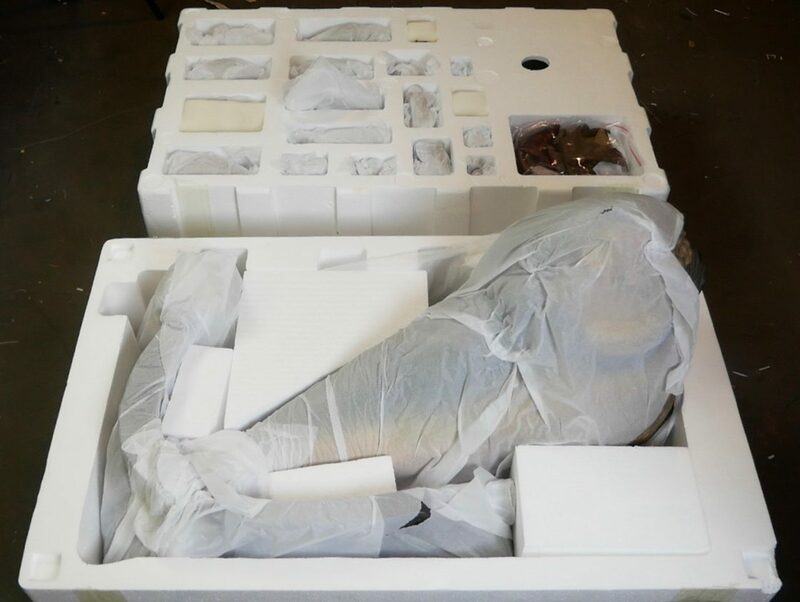 As you can see from the photo above, this set comes in a rather impressively large box (old Sideshow Jabba for scale). The old Jabba figure was sold separately from the throne, so this is the first time we’ve had everything packed in one huge box like this. Opening up the shipping box and the color box inside reveals two styrofoam trays. The top tray (in the background above) contains all of the little pieces and accessories for the set (more on those shortly), and the bottom has Jabba himself and the throne kind of wedged into each other. It all seems pretty well packed, but I do think it would be extremely challenging to repack. The Jabba figure himself is quite different from the original Sideshow release in almost every way. There are differences in sculpt and paint that we will get to, but the more fundamental difference is that it really isn’t a “figure” at all. 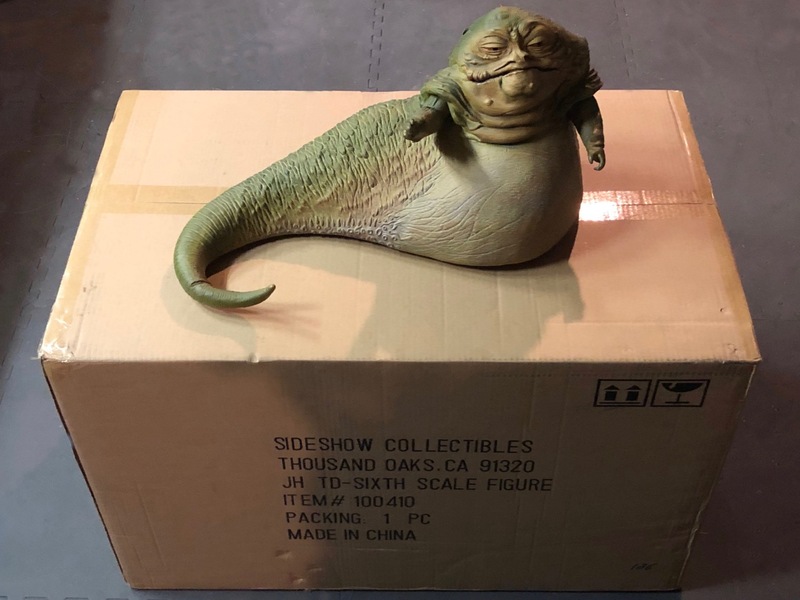 Unlike the previous Jabba, which was made of vinyl, this one is made of a hard resin-like material (at least from what I can tell) and is essentially indistinguishable from a statue. As you can see from the photo above, they even have a bit of a bend in his tail where it is supposed to hang over the throne, and this means that he doesn’t sit properly if you try and put him on a flat surface. Clearly, he is just meant to be on the throne and not really “played with” in the same way that was possible with the old figure. The first thing that struck me when I opened him up was how much better the paint job on the new Jabba is (click the photo above to see a bigger comparison photo). It’s not that the old Jabba was badly painted, exactly (although the paint job was definitely simpler and the eyes were unforgivably basic). But with the new figure they’ve done exceptional job of recreating the many different colors that made up Jabba’s signature look. The most important thing is probably that they actually made his face and belly orange. It’s incredible how many figures and statues get this wrong, either by making him totally green, or by going for more of a beige color (although to be fair this can be partially attributed to some of the changes that Lucas made when with the CGI versions of the character). This is just a fantastic paint job, and I don’t think it’s a stretch to say it’s the best paint of any Jabba figure or statue ever. If you look at the Sideshow version above, you can see that they used a more yellowish green look for him that just doesn’t look quite right for a Return of the Jedi Jabba. The photo above is a photoshop composite, so please don’t use it for size comparisons, but it’s pretty close to being the right relative scale. So yes, the new Jabba is also noticeably larger than the previous version. The previous Jabba did have some very minor articulation in the arms, but for this one they decided to get rid of even that. In its place, though, is something potentially much more interesting. 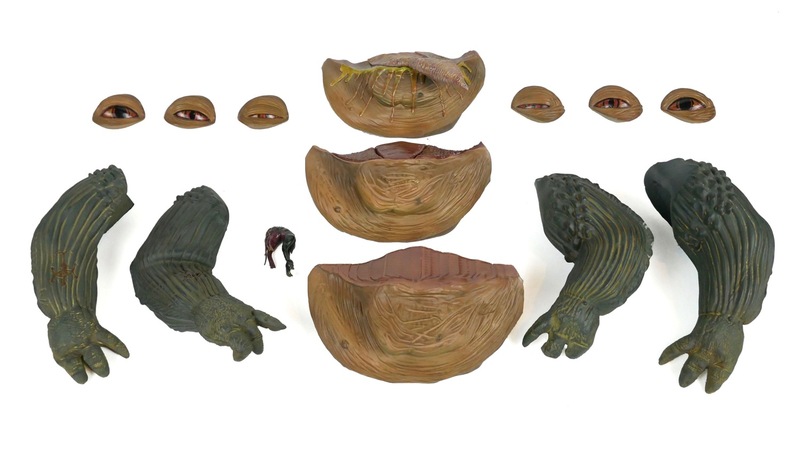 The new Jabba has a number of swappable parts that allow you give him different facial expressions and arm positions. The photo below is more than a little terrifying, but it shows what Jabba looks like without his face parts attached. They just fit in there and remain attached with magnets. It’s the same story with the arms. Jabba comes with a pretty respectable array of swap-out parts, including four arms, three mouths and six eyes (as well as a little klatooine paddy frog snack that I included in the photo below). I think this is a brilliant idea, because one of the things that made Jabba from the film seem so realistic and alive was that he wasn’t just a static mask. He was an honest-to-goodness puppet capable of all kinds of emotions. 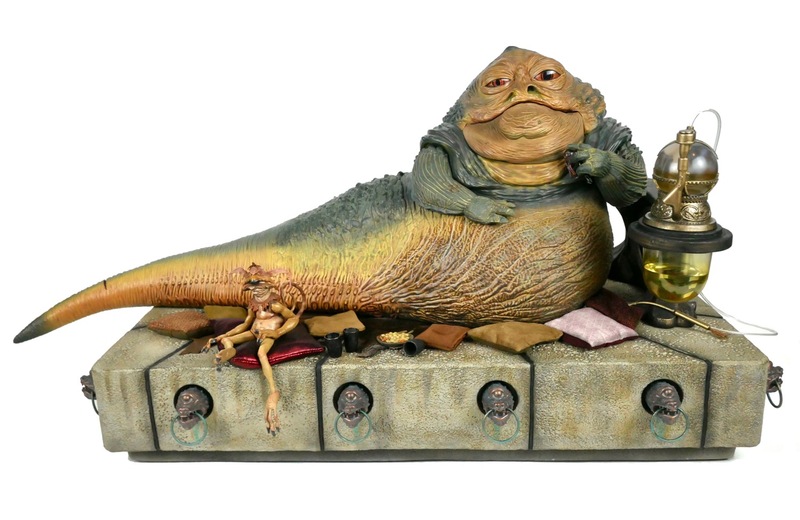 Every other Jabba figure and statue ever made has had to choose one static facial expression, so we’ve never really had a “surprised” “angry” or (especially) “sleeping” Jabba before. That’s a huge deal. This, in combination with the arms really gives this figure a lot of personality. I do think the sculpt looks a little bit stylized in places compared to the original figure, but it’s amazing how much of a difference changing out some of these parts can make to the look of the figure. You can see the joins where the parts meet the face in some of these closeup shots, but when you’re looking at the figure from a normal viewing distance they pretty much fade into the rest of the wrinkles and are not noticeable. Above: Jabba about to have a snack (the klatooine paddy frog accessory sticks to his grasping hand with a magnet). Above: Sleepy-time Jabba. You can also use one of these partially closed eyes in combination with an open one to recreate his “lazy eye” look, but it looked a little off to me and so I didn’t even take a photo of it. I prefer the slightly more open versions for that. Above: Perhaps the most controversial mouth is this one, with his tongue sticking out and a lot of drool coming down. The drool looks a little weird — like it’s forming a uniform starburst pattern or something — and the tongue also looks a bit too bulbous in my opinion, but it’s still a fun one. 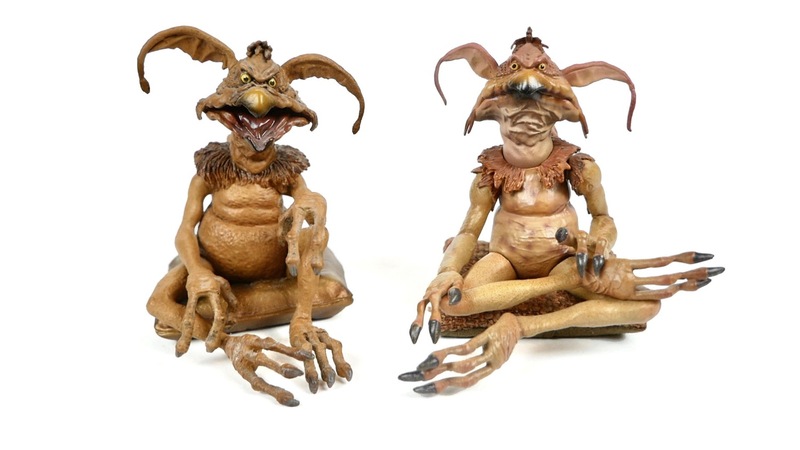 The set also includes a Salacious Crumb figure with a similar array of swap-out parts. You get two sets of arms and legs and two heads, but only one body. The problem with using this approach for Crumb is that the arms and legs have all been sculpted to give him a certain pose. The parts are marked either red or yellow on the slots that go into his body, and in most cases trying to combine the “yellow” parts with the “red” ones doesn’t work well. Either the parts don’t fit at all or they look a bit awkward. What this means is that despite all of this apparent flexibility, you basically just have two poses you can use. I feel like it might have been better to just give us two fully-sculpted Crumbs in different poses. They are sculpted and painted very nicely, but seem quite fragile. In fact, while I was filming my video review, I dropped one of the heads a couple of inches onto my table and the tip of one of the ears broke right off. I was able to glue it back, but the ears in particular seem insanely fragile due to the materials they used (again, I’m guessing it’s a kind of resin). The previous Sideshow 1/6 scale Salacious Crumb figure was made of a rubbery plastic that isn’t likely to break until you seriously abuse it. Below are the old and new versions together (old on the left, new on the right). The difference isn’t nearly as stark as between the Jabbas, but I do still prefer the new one. Of course one of the main attractions of this set is that it doesn’t include just figures — you also get the full throne environment. In terms of size and general design, the new throne is very similar to the old one, but the paint is greatly improved and it’s also significantly lighter. The old throne was made of polystone, while this one appears to be hollow resin. It’s still got a nice weight to it, but it’s not as insanely heavy as the old one. They even put some cool artwork on the bottom of the throne, even though most people would probably never see it. 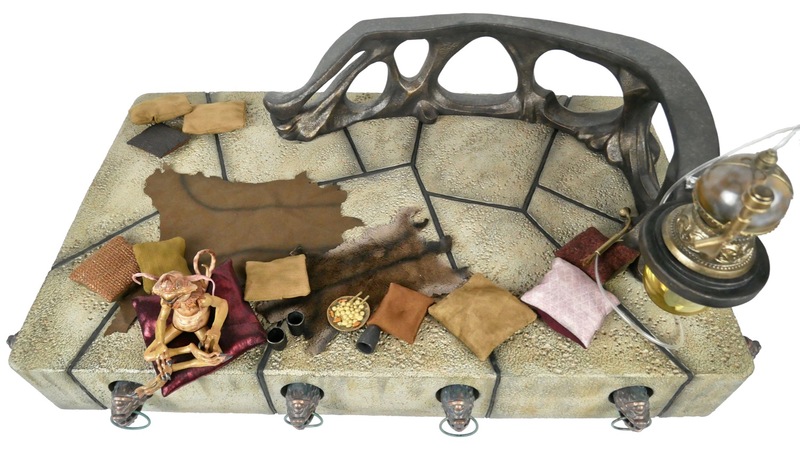 You get a number of accessories for the throne, including 11 pillows, 3 glasses, a plate of food, and two “animal skins” (one that looks like a piece of leather and one that looks like a fur). The fur piece is very impressive in its coloration, but the “leather” piece seems a little artificial and almost paper-like somehow. The pillows are actual cloth pillows filled with some kind of pellets that allow you to pose them semi-realistically. The previous throne only came with a couple of pillows that were made of resin or polystone, so this is a nice upgrade and gives you some flexibility with how you display them. My only concern is that they will probably attract dust when the set is on display over a long period of time. 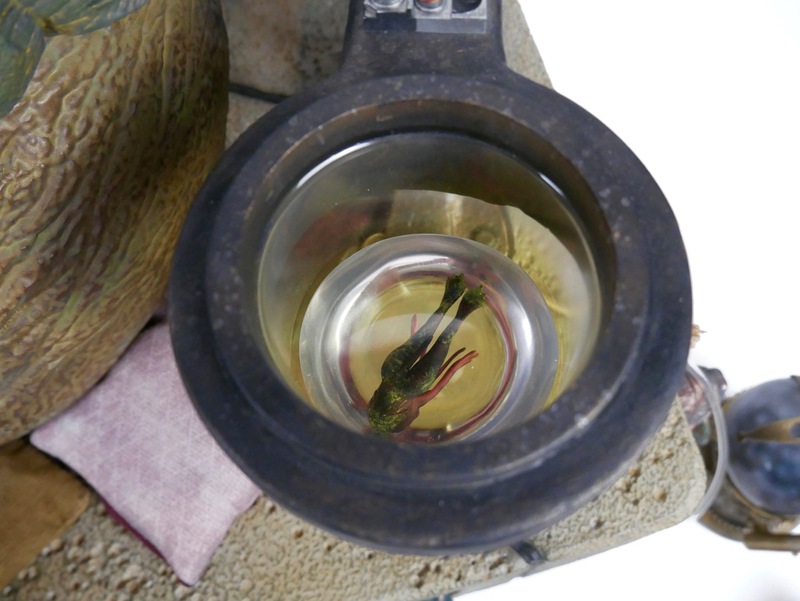 The frog bowl in the throne railing can actually be viewed from above, unlike the previous version, and there is a little piece of transparent acrylic with a frog in it to simulate water. There is a coating inside the bowl that makes the clear resin look a bit more yellow and murky. I think the effect works pretty well. 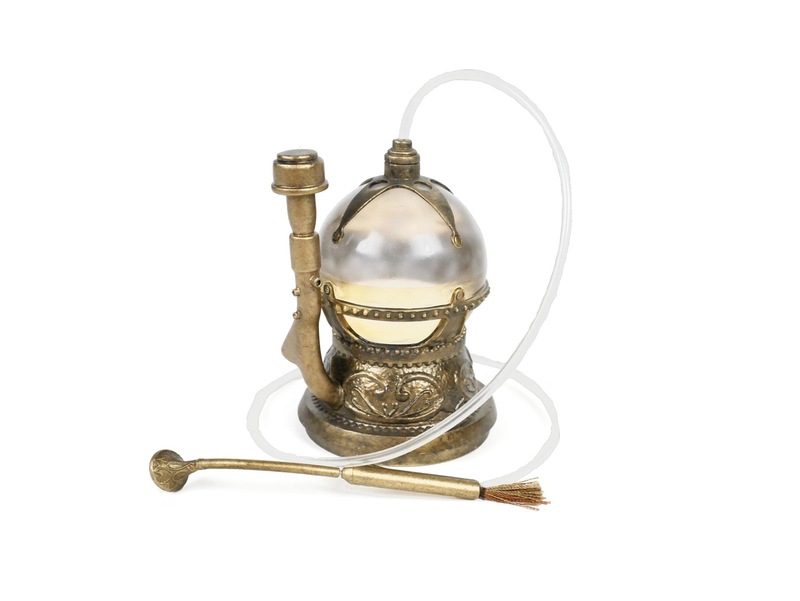 On top of the bowl goes the hookah pipe, which is also a bit of an upgrade from the previous one. The dome is actually a transparent piece of plastic or glass and it has a bit of a smoke and liquid effect applied to it as well. The pipe part comes apart into two pieces to help you get it into Jabba’s hand, although I think it may actually be easier to just leave it in one piece. Once you’ve put all of the pieces together, the effect is really quite impressive. 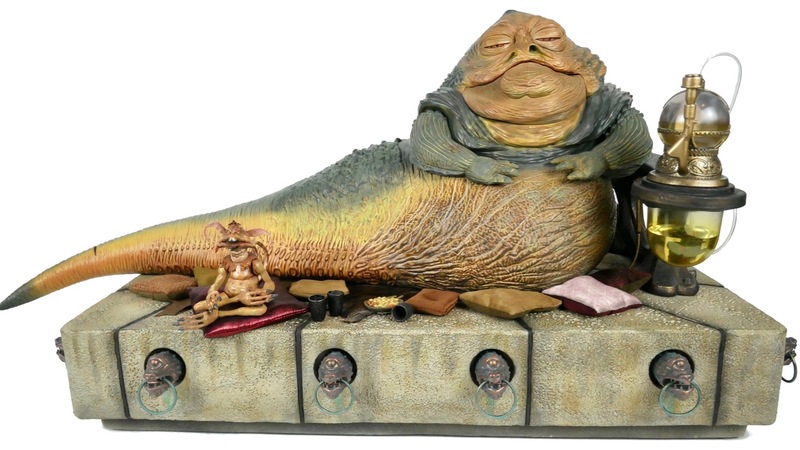 In fact, I’m willing to say that this is not only the best Jabba figure or statue ever made, it may very well be the best Jabba collectible period (although that is of course open to debate). That’s not to say that the old version is suddenly terrible. It’s still a very cool piece, and I could understand owners of the old version not wanting to rush out and replace it (especially for $799). See below for a couple of comparisons between the two sets (these are so large that photographing them is challenging, so I had to just put them on my basement floor). 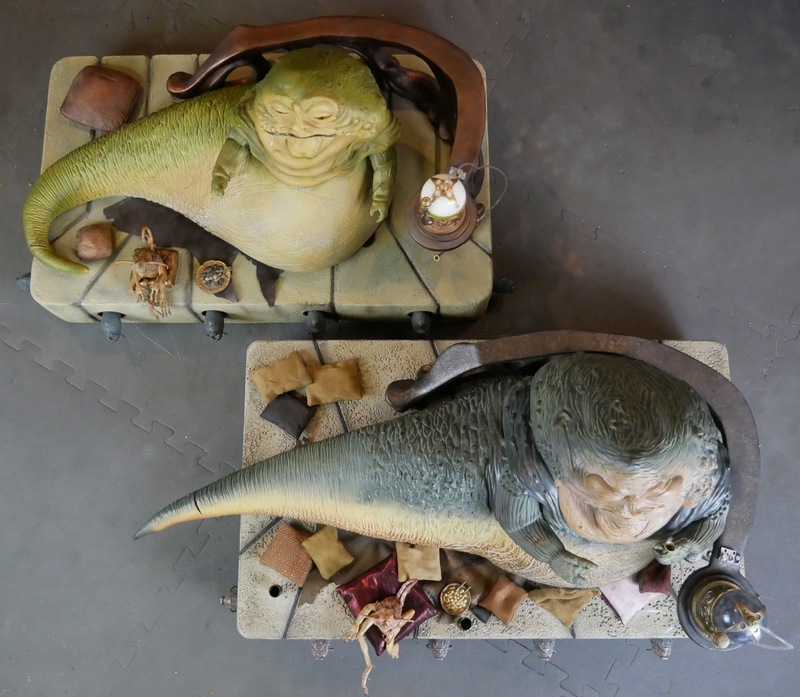 As you can see, the thrones are nearly identical in size, but the new Jabba is quite a bit bigger. Also the additional throne accessories and the better paint job just make it look more impressive. I will of course be keeping the old version, but I do need to find a good place to display it, since it isn’t easy to find space for two collectibles of this size. The question of whether this is worth $799 is going to be a tricky one to answer. 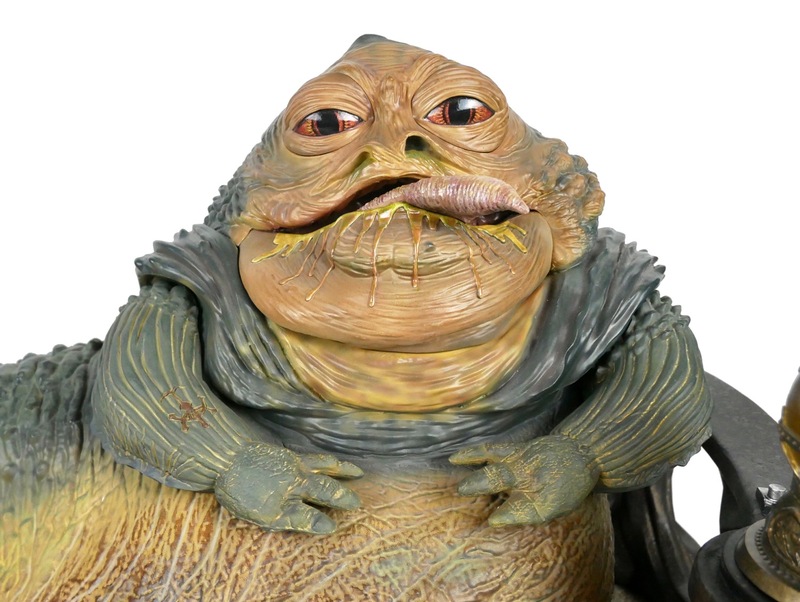 It is to me personally because Jabba is my favorite character and the focus of my collection, but even for me it is a significant amount of money. It seems all the more expensive when you consider that 12 years ago the original version cost $120 for the figure and $200 for the throne. But you have to keep in mind that Sideshow’s regular 1/6 scale Star Wars figures were going for around $60 at that time, and now they are close to $250 apiece. True, there has been a significant increase in quality in that time as well, but generally speaking these prices are what drove me from 1/6 scale figure collecting in the first place. Whether he’s worth the price tag is ultimately up to you, but I can say that this is an exceptionally well done set, and I doubt that anyone considering buying it would be disappointed with it.